Birmingham City Council have now issued a statement to clarify the situation with new speed limit signage as new 30mph signs on A38 and Lickey Road are covered to avoid confusion. A spokesman said: “As part of the Longbridge Connectivity Project, and to improve road safety, the existing 30mph speed limit on Lickey Road will be extended up to the Bristol Road South junction. 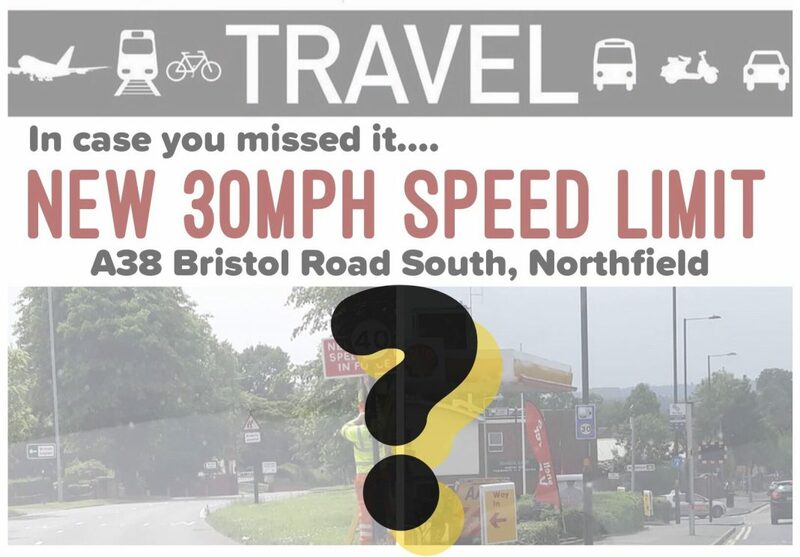 On Bristol Road South, the speed limit will be reduced from 40mph to 30mph from just west of the Park Way junction up to the existing 30mph limit at Northfield. Readers were confused after signs for a speed limit change – from 40mph to 30mph – appeared on the A38 between Northfield and Longbridge yesterday (Monday 4th June). B31 Voices now understands that speed limit changes between Northfield and Rubery will not be implemented until later this summer. The 30 limit speed camera signs appeared, leaving locals worried that they may be hit by a barrage of parking tickets. Motorists were unsure what the speed limit actually was, since both 30 and 40 signs appeared to be in place for the same section of road. B31 Voices has been awaiting a statement from Birmingham City Council highways department but this evening it appears that the 30mph speed camera signs are being taken down as workmen tell a local councillor they went up ‘too early’. We understand that the A38 speed limit will become 30mph between Northfield, all the way around to Great Park in Rubery once the works being carried out on the route as part of the Longbridge Connectivity Plan are completed. All the 40mph signs will be removed – 30mph signs will not be necessary since the Traffic Regulation Order (TRO) will be revoked back to the urban speed limit of 30mph. The work is expected to be completed and the 40mph TRO revoked later this summer. Until that is done, the limit remains at 40mph. Another example of the lack of joined-up thinking at the Council. No wonder its in so much debt! is it the councils fault or is it the private company they’ve paid to do the work who’ve contracted it out to various individual firms without ensuring they are all on the same page? What a MESS the A38 Bristol road South is in, A VERY LARGE ISLAND far bigger than needed so traffic can’t get round it, Slip roads here and there that don’t go anywhere or face the wrong way,Lights that have been switched off and been replaced by temporary ones and 3 men standing there all day to make certain they work, now the speed limit is to be lowered to 30mph to save accidents In the 60 years I have been driving up and down it I could count the accidents on one hand AND BIRMINGHAM COUNCIL TELL US THEY HAVE NO MONEY? ?Who ever thought it all up wants sacking. 30 limit is just plain stupid! Get ready for increased traffic and increased emmisions! Way to go green BCC NOT!